Food Wishes Video Recipes: Black Eyed Peas with Pork and Greens – Good Luck with This! Black Eyed Peas with Pork and Greens – Good Luck with This! I love the New Year's day tradition of eating beans and greens to bring luck and prosperity. This video was posted a few years back, and features black-eyed peas, and not one, but three kinds of pork. How can that not bring good fortune? This is a very old tradition, and I don't mean colonial America old, I mean really, really old. There are records of black-eyed peas being eaten for good luck on New Year's Day all the way back to ancient Babylonia. It must have worked, because look at all the good fortune that has befallen the middle east since then. Okay, maybe that's not the best example. This video recipe is my variation on something called "Hoppin' John," which is black-eyed peas, rice, and pork stewed together, usually served with some kind of greens and cornbread. Speaking of which, I highly suggest clicking on my cornbread recipe video and doing this thing right. I want to wish you all a Happy New Year! May your 2011 be filled with much happiness, and lots of new adventures. Stay safe, party hard, and as always, enjoy! We cannot eat pork. Could this be substituted by beef? If so, what cut (besides beef neck because that is not available where I live)? Sure! You can use something like a beef short rib, or even a smoked beef sausage. Well shucks, too late to hit the stores for supplies. I will have to hope my lobster is equally lucky tomorrow. The drawback to substituting the pork will be losing the smoky good flavour of the ham and the bacon. While still tasty without I think it would be missing something. The idea of smoked sausage is good or maybe even a touch of Montreal style smoked meat might be interesting in this recipe or use smoked salt instead of regular. I find smoked salt can do wonderful things to perk up a dish when other smoked flavour is not available. Awesome stuff. I hope anonymous will try it with beef and let us know how it worked. If you don't eat pork, try it with smoked turkey and "turkey bacon." They're fine substitutes (once you get used to them). oh, wow! that looks so nice and a hearty dish. by the way, can i use ro-tel? only, because that's what i have on hand at the moment. Oh, my gosh - what a fabulous recipe!! The flavor is incredible, complex, and so well balanced. 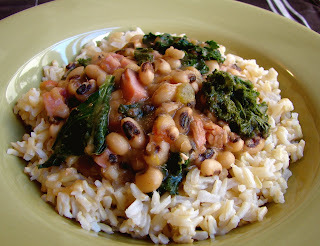 I would never have thought to cook the kale in the Hoppin' John but it's so much better than cooking it separately. Because I could cook at my leisure, letting the contents simmer while I made several sides, there was no pressure and I thoroughly enjoyed the entire preparation. Thank you once again, Chef John. Another winner! Thank U sooooo much for this excellent recipe ! I've got it simmering in the slow-cooker this moment and the house is smelling fabulous ! - pork and greens just taste good, but have no 'magic' properties. We eat them anyway. They taste magical. This is also perfect hangover food. When you drink a lot of alcohol, your liver makes a lot of bile, and the fiber in the beans and veg soaks it up and gets rid of it. Kale and other greens also have potent detoxifying properties. Also, when are you going to do a fan picture day where we all take a pic of a meal we made? Any idea how many this will serve as a side dish? As I live overseas and it is night time, I am presently soaking my peas! Question - no Neck bones or Smoked ham, (do have bacon!) I do have kielbasa as well as a very generous sized ham hock. Should I/can I substitute them for the neck bones and ham? How do I deal with the extra fat from the ham hock? Looking forward to making this tomorrow! Any meat works! Just skim the fat off top. was going to try Coq au vin this weekend but I'm doing this instead. The luck promised by the dish is probably a bunch of hooey...but hey...it couldn't hurt to try. No rice for me. I'm going with cornbread and collards. I could live off of cornbread and pot liquor. Never cared for the peas but my family would just heat up a can, throw it in a bowl...well you get the picture. This looks really good and has copious amounts of hog in it. Hog is gooood! I followed the Chef's instructions like it was the word of God and this dish was absolutely delicious. The thing is it was a taste I never tasted before. I used Jowl bacon and fresh tomatoes, cause I forgot to pick up a can, and it came out perfect. I couldn't stop eating it. A new tradition this will be in my house. While I do keep a spare artery in my wallet this is something that I would not want to over indulge in...but once a year...why not! Thanks Chef! I have a dumb question...I made this dish today to be served tomorrow (because of time). It turned out really really good. It looks though like the liquid is absorbing though and I'm concerned there will be next to none left when I warm in tomorrow. If I add some water to it and let it simmer for a little bit, will that be ok? I'm afraid it will just be either watery tasting or overcooked. Sorry, but you'll have to play it by ear. It will thicken up the next day, and you will need to add some water probably. Should be fine! For those of you looking to substitute pork, use smoked turkey. Smoked turkey necks or smoked turkey legs would work perfectly. It's that smoked taste you would be missing without the bacon, by substituting smoked turkey, you will still get that flavor.